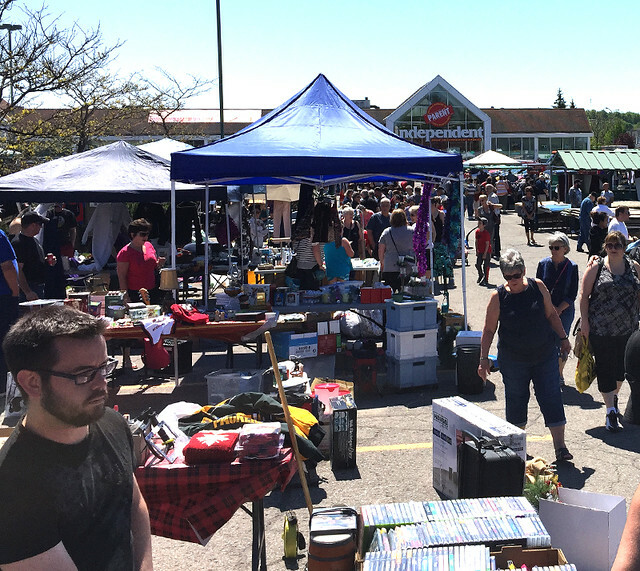 The whole town of Rockland sets aside the holiday Monday of the Victoria Day Weekend every year for the Rockland Community Garage Sale. 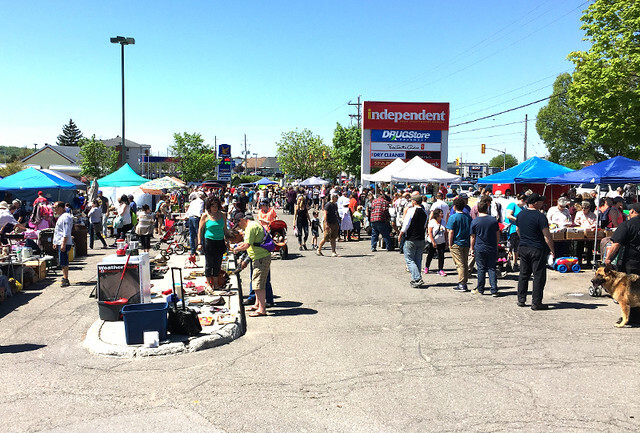 The sale centers around the parking lot of the Independant Grocer on Laurier Street, where a flea market pops up for the day while the main store is closed. (I believe the garden center was open, though.) While this is the hub of activity, the sales continue throughout the town and a leisurely walk or drive around will lead you to some scores. I spent the day out searching for finds with a friend of mine. She’d been going to this sale for many years, and she is the one who alerted me to its existence — I’d never gone before! 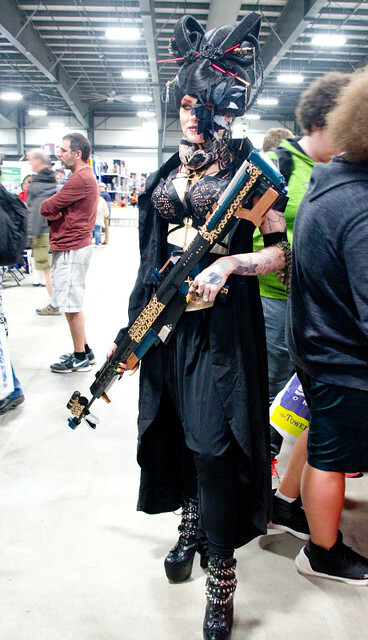 My friend was hoping that a particular booth with scrapbooking supplies would be there again this year; sadly, we never found that particular vendor. However, we both came away with some fantastic bargains. 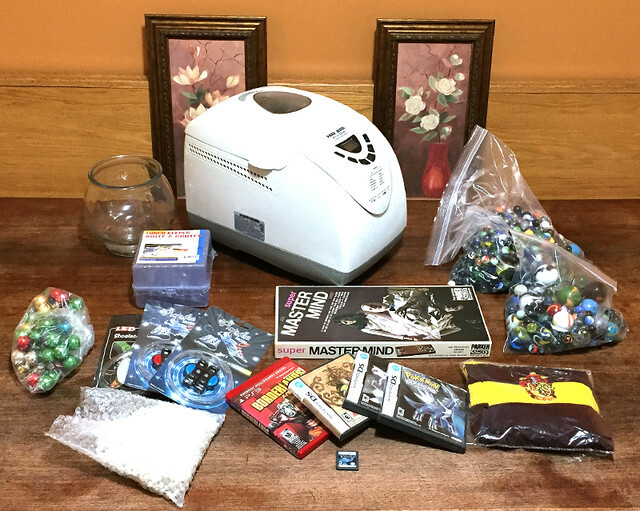 According to my math, that means that I spent $56.25, which is generally more than I’ll spend in a day of thrifting, but those DS games will be saved for Thing 1’s birthday, so I feel I’m ahead of the game there. 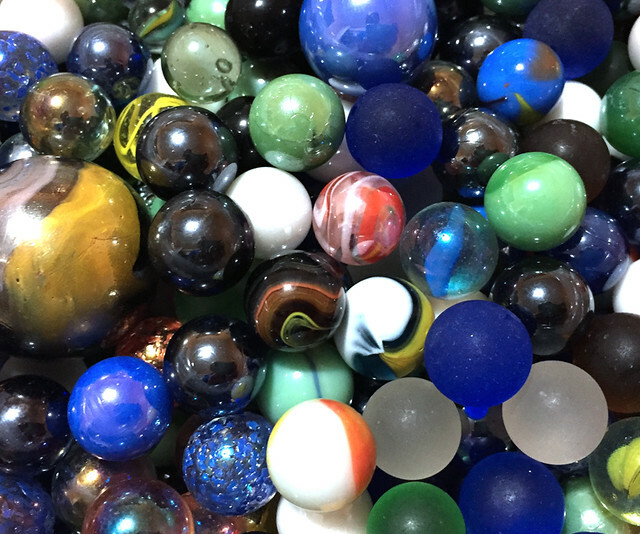 I think my favourite find, I think, was the big bags of marbles. This was a combined purchase from a couple of different sources, but I love the look and weight of them all. I’m determined to teach the girls how to play this summer. I don’t know how they’ve managed to miss it, but although the kids have a double-set marble run that they build regularly, they don’t play the game the way I used to as a kid. I think it’s a good thing to learn, and maybe they can teach it to their friends. Who knows, perhaps I’ll start a classic childhood game fad at their school? 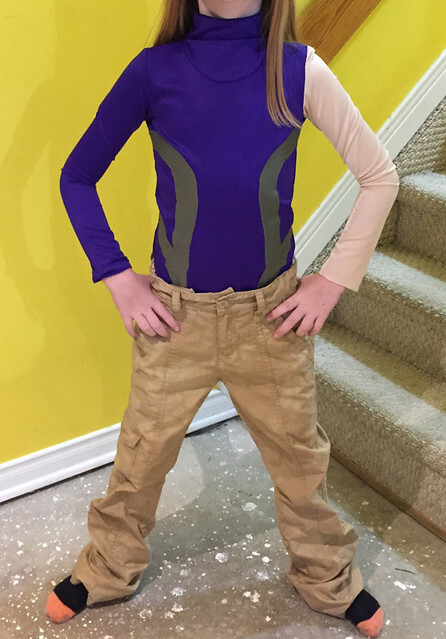 Still plugging away at those costumes… I think I’ll have the kids’ done in time, but I haven’t even started on my Friday costume. Eek! 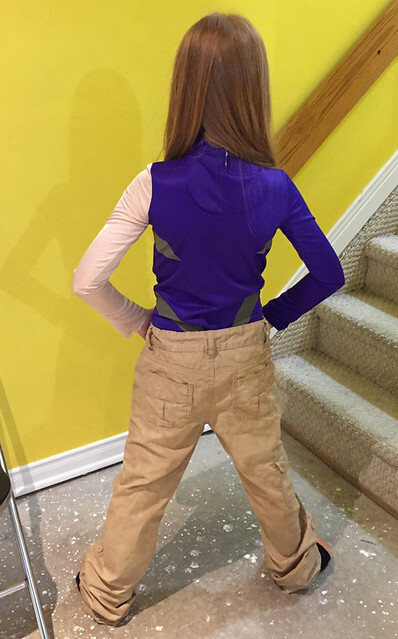 And yet, I remain super proud of myself because I successfully both sewed and appliquéd Thing 1’s spandex bodysuit. I mean, I know it’s not perfect, and there’s a lot of detail work yet to be done, but the bones are there. It was the bones I was most worried about, actually. 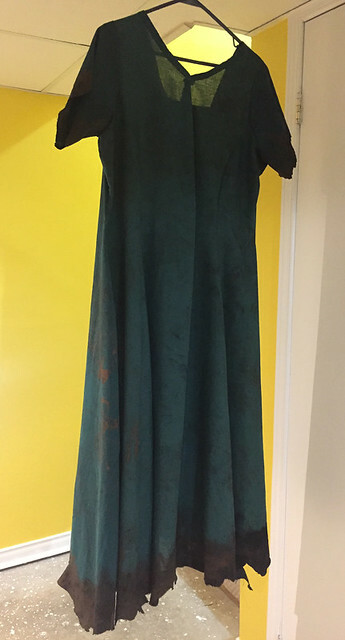 And I think I’ve finally found something to weather my Saturday costume that actually stays… I jumped all over this costume in the black soil of the garden twice, but the stains wouldn’t stick. Go figure. I mean, if you look at my actual gardening clothes, you’d think that staining my clothes with it would be a given. In the end, I’ve found what works best is plain old dollar store acrylic paint. Costume prep is on hold for a bit today while I prep for the Blackburn Hamlet garage sale, because I have so much stuff to get rid of. This is what happens when you buy things in lots. Hopefully sewing/crafting will resume later tonight or tomorrow night. 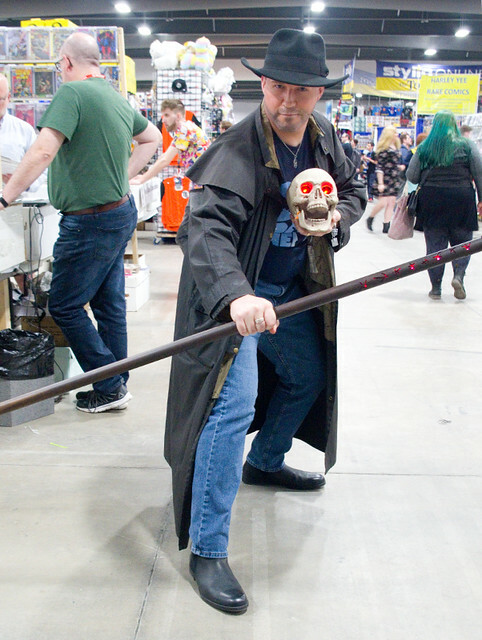 Photo by Karen Turnbull of last year’s Ottawa ComicCon. For now, May the 4th be with you! 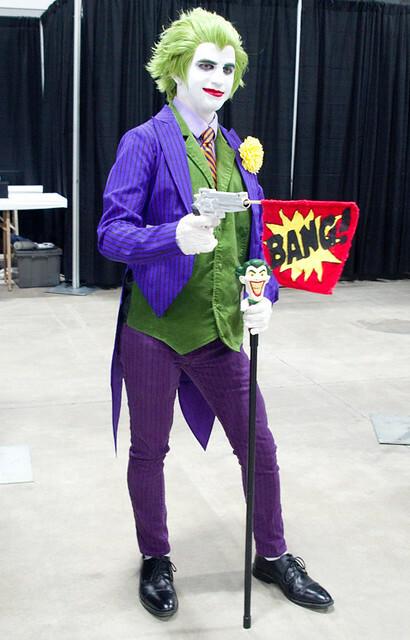 I brought my camera along to Ottawa ComicCon on the days where my costume would allow it, and I took plenty of photos. 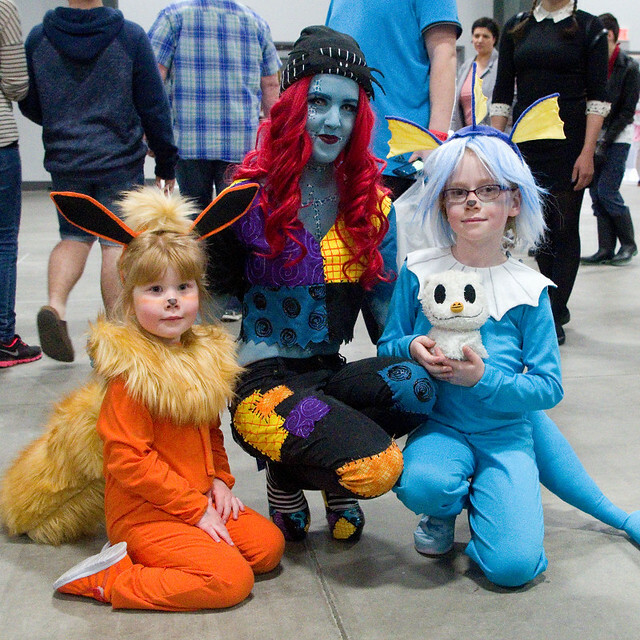 Of course, I didn’t notice that my ISO was bumped up ridiculously high until well after the fact — something about wrangling children and costumes in a crowd makes photography somewhat challenging. So most of my photos are really grainy. 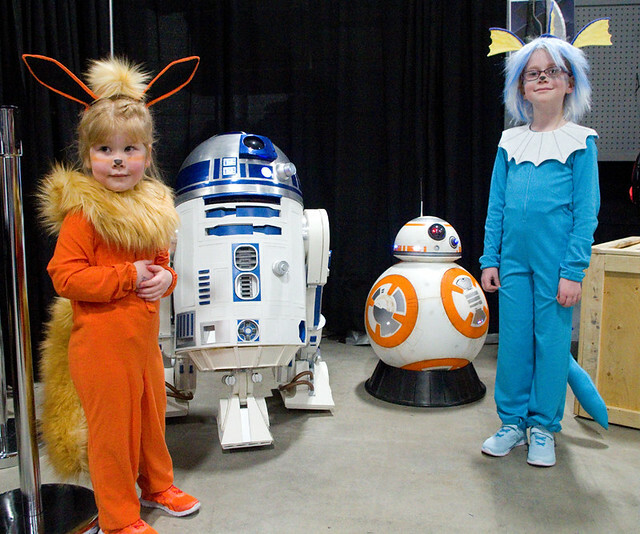 Even so, I here are some of the most fun costumes that we saw; of course, the ones my kids wanted to have their pictures with are ones that they’re familiar with, so Friday’s photos concentrate on kid-friendly productions. 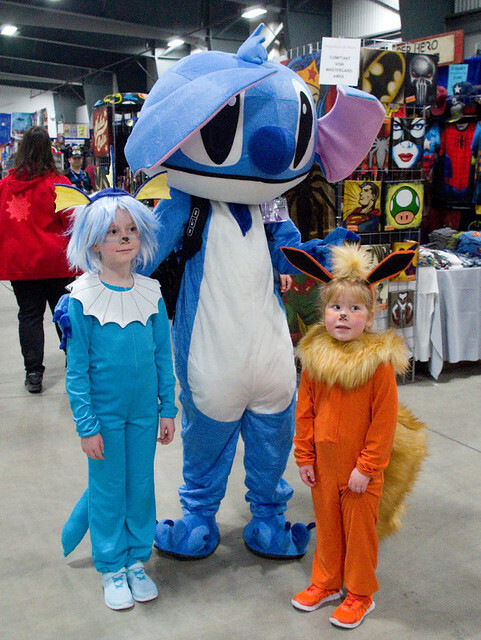 Thing 1 and Thing 2 with Stitch (from Lilo & Stitch). 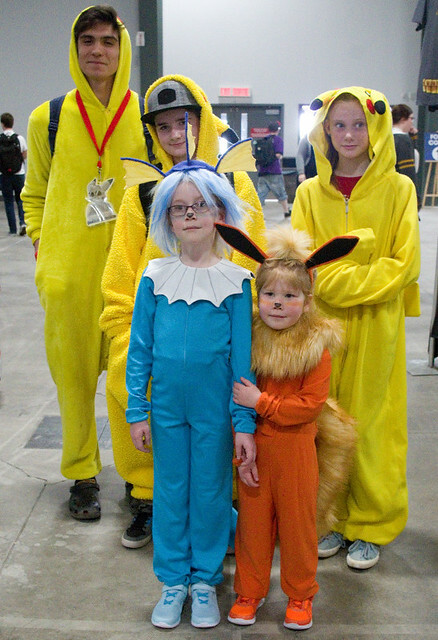 We found three Pikachus (Pokémon) in the same area, so we rounded them up to take photos with my little Eeveelutions. I don’t think any of them know each other. 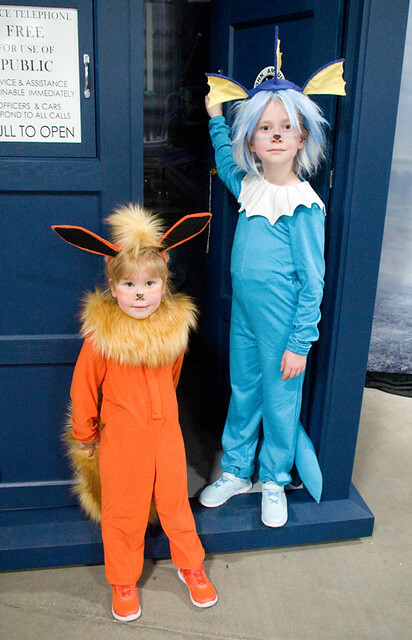 Thing 1 and Thing 2 in the T.A.R.D.I.S. in the Doctor Who booth. 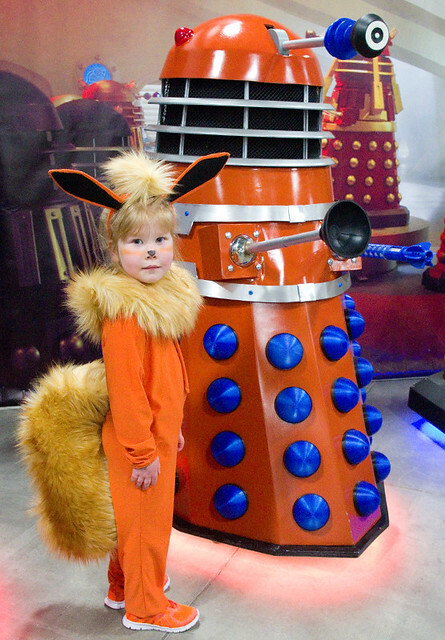 Thing 2 with a Dalek, which was her favourite because it was orange, her favourite colour. In the Doctor Who booth. 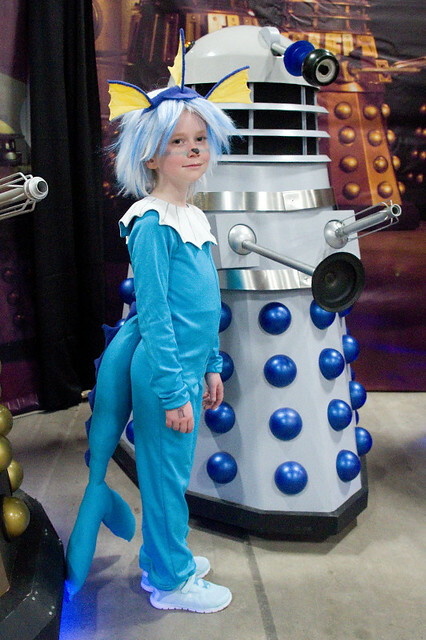 Thing 1 with a blue-and-silver Dalek in the Doctor Who booth, also chosen because it contains her favourite colour. 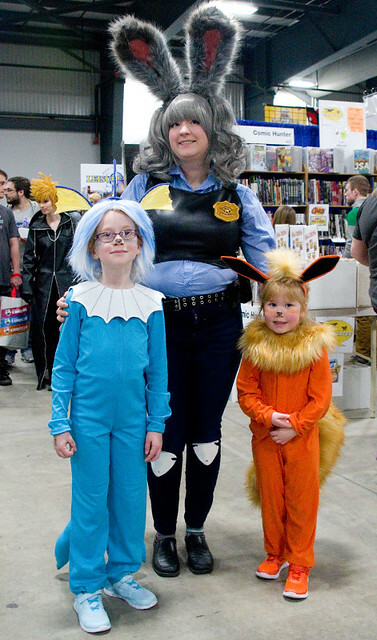 Given that they went as characters from Zootopia last year, Thing 1 and Thing 2 were thrilled to meet Judy Hopps. 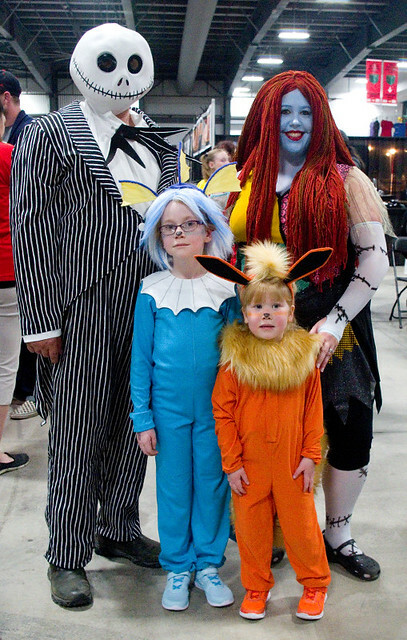 Thing 1 and Thing 2 were very happy to meet Jack Skellington and Sally from The Nightmare Before Christmas — especially Thing 2, as it is her favourite movie. Don’t let her expression here fool you. 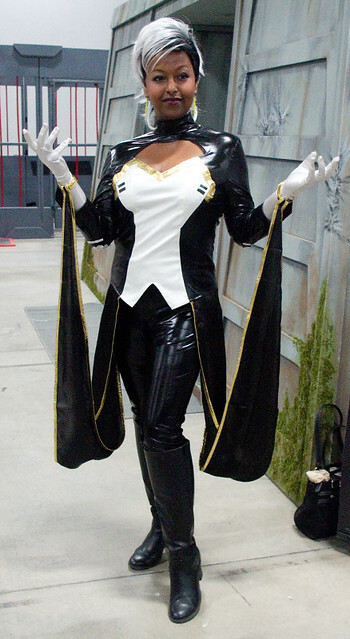 My mother took the kiddos for a few minutes, so I had a chance to snap a pic of this fantastic Storm (X-Men). RWBY character Ruby, with a Grimm. 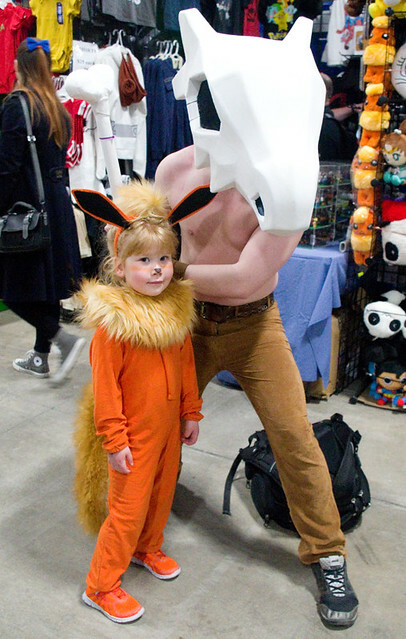 Thing 2 with Pokémon Cubone. This poor guy couldn’t see through his head piece at all! Looked great though. Thing 2 and Thing 1 with Hipster Sally (The Nightmare Before Christmas), as executed by the fabulous Lilithia Dark. She even let Thing 1 hold her stuffed Zero! The girls were super excited — once again, especially Thing 2, who adores this movie. “Mommy, she was so awesome!” I agree. 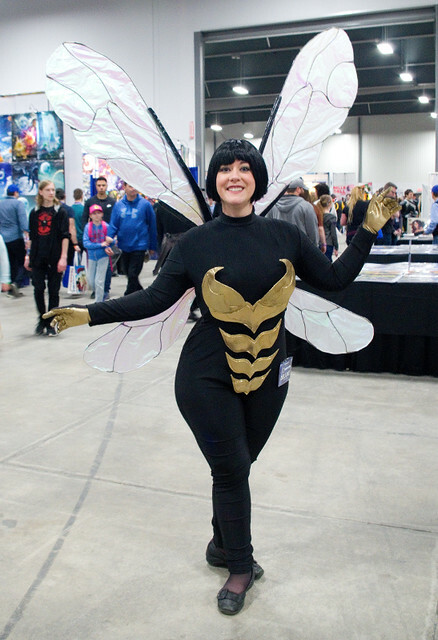 If you recognize yourself or anyone you know in my photos and want me to link to your cosplay page/Facebook/blog, just let me know! 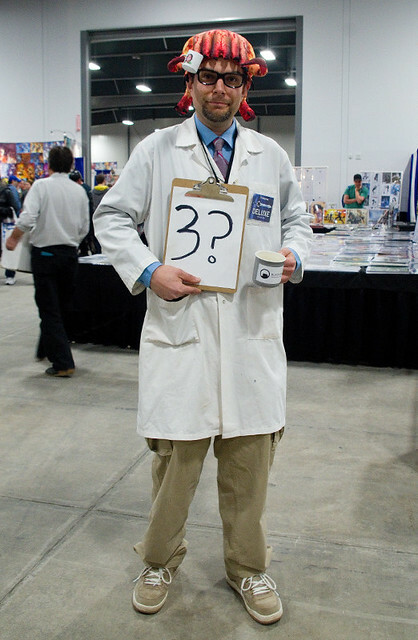 The countdown to ComicCon continues, and I am seeing some progress. I’ve managed to get Thing 2’s bodysuit finished, which is, to me, the most difficult part. I hate sewing stretch fabric, but a bodysuit really needs to be stretchy. 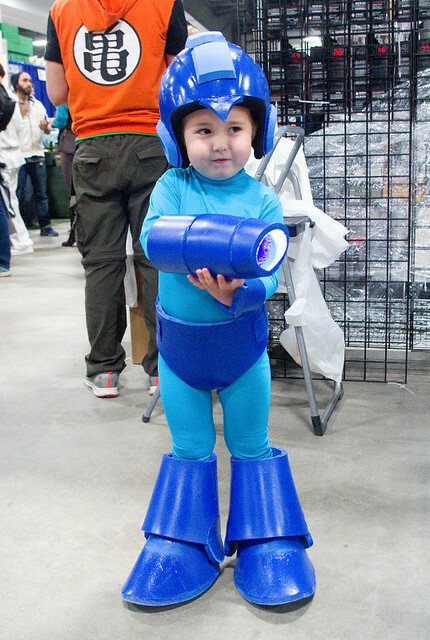 This is especially true for children, who will shed costume pieces if they find them too uncomfortable. 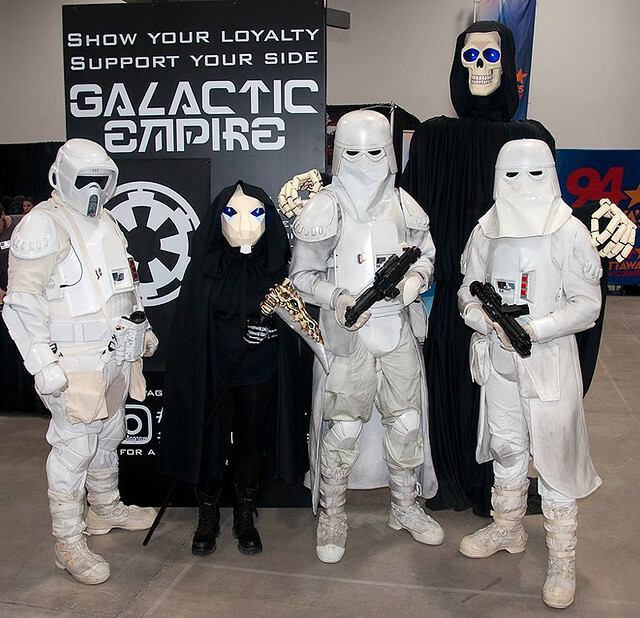 These costumes have to work for ComicCon and Halloween, so I’d like them to be worn for more than five minutes at a time. Of course, when sewing this bodysuit I managed to put in one of the sleeves inside-out the first time. This seems to be an inevitable state of affairs for me whenever I make clothing. I also painted Thing 2’s shoes for the costume, since we couldn’t find any in bright orange. 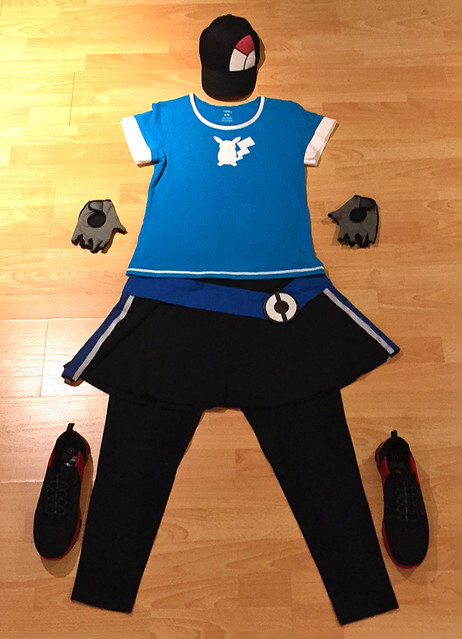 My Day 1 costume is pretty much complete, much to my great joy. I didn’t do a lot of sewing for this one (just the belt and the white part of the sleeves, actually), but there were a lot of little details that needed to be carefully painted and then dried. I probably could have sewn it in less time, but definitely not for less. The cap was $5.00 at Michaels, the shirt (which was blank and plain blue at the time) was $2.49 at Value Village, and the skirt was $3.99 at the same place. The gloves were $2.50 at the dollar store. I already owned multiple pairs of black leggings. The belt was made out of scrap fabric from my stash, and the buckle was made out of a $0.79 plywood circle from Michaels. The most expensive things were the shoes, which I paid $29 for (I think) at Payless, but they’ll get lots of use after the Con, so I don’t feel too bad about that purchase. Looking to expand my culinary horizons, I picked up a few packages of frozen boar meat from the grocery store a while back. The fact that it was on clearance might have dictated my choice somewhat; most wild meat is, well, wildly out of my budget. The best special was on wild boar medallions wrapped in pork bacon from Natural Frontier Foods. I had seen something similar before done with chicken (M&M Meats does a decent one), but I’d never tried boar before. 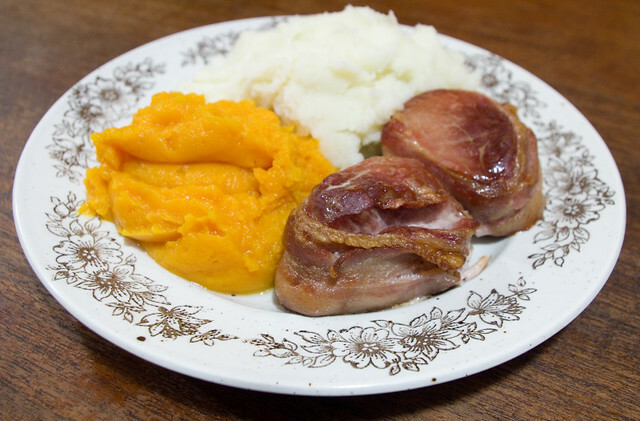 Wild boar medallions with bacon, mashed sweet potatoes, and mashed potatoes. The original plan was to barbecue, but it pissed down rain all day, and even if I did juggle the food and an umbrella, I didn’t want to deal with the mud in the back yard. Instead, I put the meat on a broiler pan and baked it in the oven, then served it with mashed sweet potatoes and mashed potatoes. Granted, it wasn’t the prettiest meal, but I enjoyed it. My first impression of boar meat is that it’s really not much like domesticated pig at all. The bacon wrapping did confuse the issue a bit, but I found the meat denser, leaner, and redder — much more like steak in texture. The flavour was a bit gamy, but nowhere near as much as venison or even lamb. It was also an extremely rich dish; it didn’t take much for me to fill up. Would I eat it again? Most definitely. However, I think I’m the only one in my house who would. My husband thought it was too gamy, and my children just ate the bacon and left most of the boar behind. I ended up with almost half of the meat packaged up in the fridge as leftovers. Perhaps I will slice it thin and make myself wild boar sandwiches for lunch for the next few days. It definitely won’t go to waste!